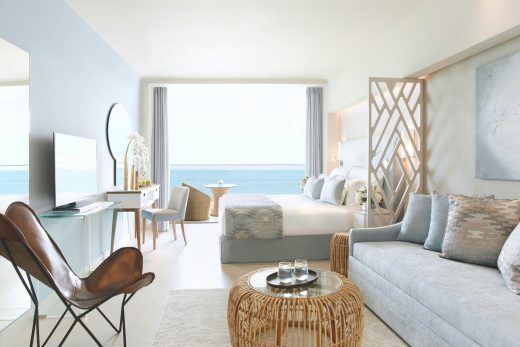 Twenty five verdant acres with a beachfront setting ensures that every one of our 411 luxurious rooms, suites and villas come with views and an ambience like no other. Spacious balconies, private gardens and individual pools add the touches that make every stay, very special. 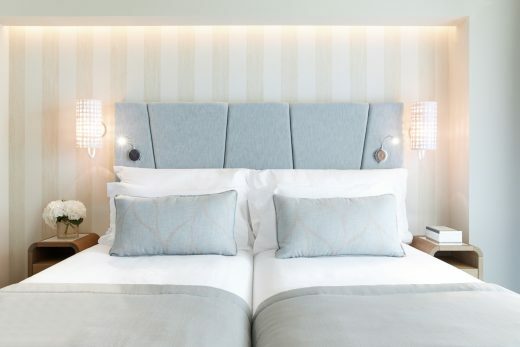 Enjoy the contemporary style and comfort of these generous double rooms in the main building. Panoramic windows and a furnished private balcony offers stunning Ionian sea or inland views. Enjoy the contemporary style and comfort of these very spacious double rooms in the main building. 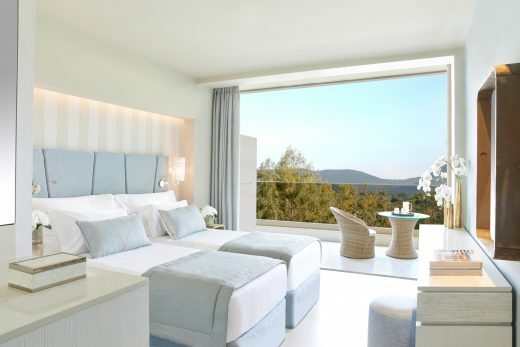 Panoramic windows and a furnished private balcony offers stunning Ionian sea or inland views. 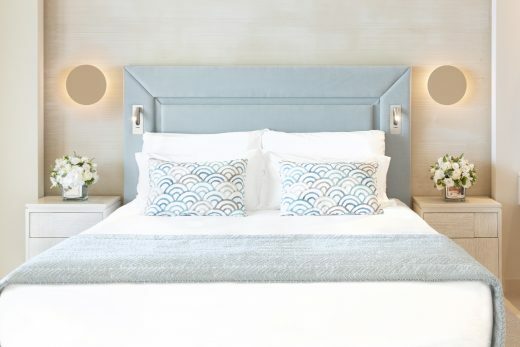 These stylish, spacious family suites provide perfectly for two adults and one child. 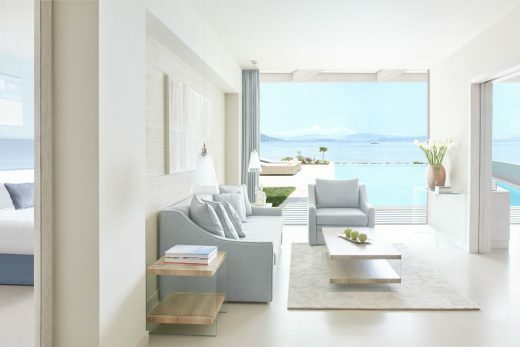 The panoramic windows and fully furnished balconies with delightful views over the Ionian Sea or inland views. 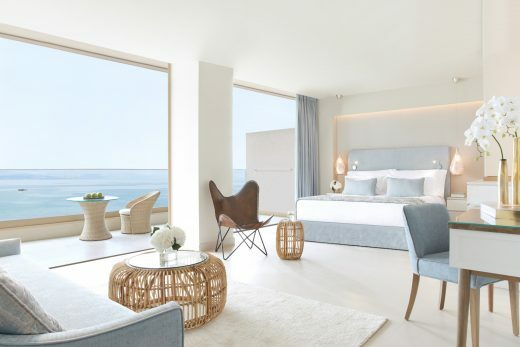 These very comfortable sea-facing family suites come with magnificent panoramic views and feature an elegant seating area. With generous space for two adults and two children they offer a fully furnished balcony or private garden. These ultra-spacious and stylish family-style suites come with a separate bedroom and lounge for extra privacy. The extensive private balcony delivers spectacular views across the Ionian Sea. The perfect space for two adults and three children. Enjoy the contemporary style and comfort of these very spacious family rooms in the main building. Panoramic windows and a furnished private balcony offers stunning Ionian sea or inland views. 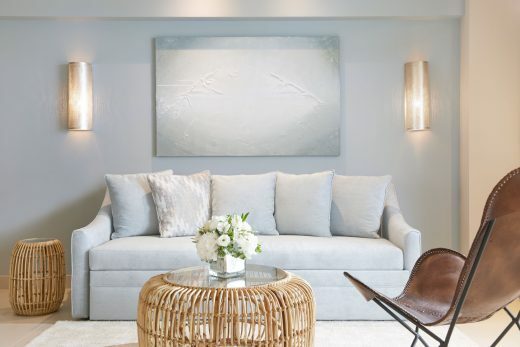 The contemporary ‘Living In-Out’ concept comes to life in these ultra spacious and chic suites, for two adults and one child, combining bedroom and living room in one airy open plan area. The spacious, elegant outdoor area features a private garden offering moments of relaxation with luxurious furniture as well as beautiful views over the gardens. With an impressive private 28m2 pool and garden and an extensive outdoor living area, these smart, chic and spacious suites, for two adults and one child, combine bedroom and living room in one airy open plan area. The spacious and elegant outdoor space offers moments of pure relaxation under an unfolding glass pergola, with luxurious furniture, as well as beautiful views over the gardens. With an impressive private garden, these luxuriously spacious, family suites come with a separate bedroom and lounge for greater privacy. Each one comfortably accommodates two adults and three children and comes with access to the exclusive Deluxe Collection beach and pool. 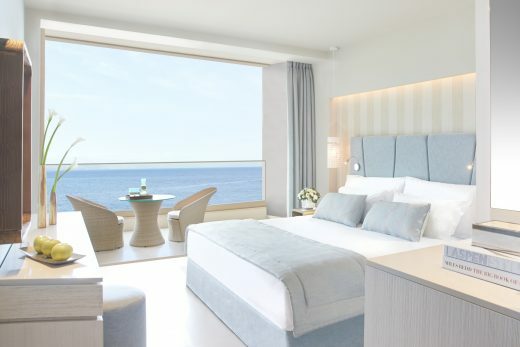 With an impressive private 40m2 pool and fabulous beachfront location, these luxuriously spacious suites come with spectacular views across the Ionian Sea and with a separate bedroom and lounge area, along with a spacious private terrace furnished with sunloungers. These ultra-spacious, luxurious family-style suites feature two separate bedrooms and lounge for greater privacy. 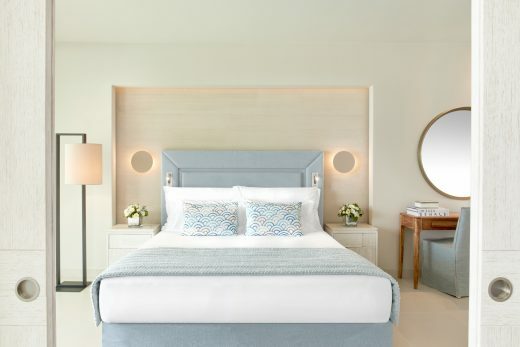 Comfortably accommodating up to six, these contemporary styled suites come with access to the exclusive Deluxe Collection beach and pool. 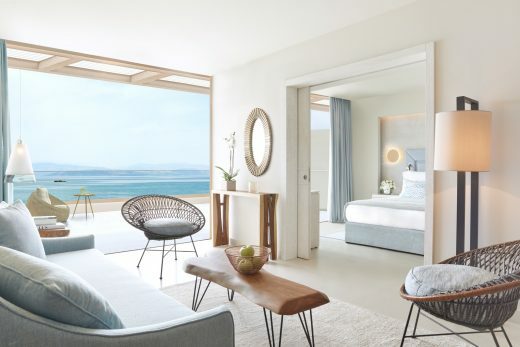 With an impressive 50m2 private pool and spectacular views of the Ionian Sea and beachfront location, these ultra-spacious, luxurious family-style suites feature two bedrooms and a separate lounge, comfortably accommodating up to six guests. With an exclusive beachfront location, these luxurious, ultra-spacious bungalow suites feature two separate bedrooms and lounge for a high level of privacy. Comfortably accommodating up to six, they come with their own private pool. With an exclusive beachfront location, these luxurious, ultra-spacious two-storey family villas feature three separate bedrooms, their own outdoor Jacuzzi, and an extensive private garden with outdoor dining area and a private pool.